Although this delicious dessert is called Zuppa Inglese in Italian, which translates to “English soup”, it’s not actually English nor a soup. It’s really a very delicious Italian dessert that’s close cousins with the more well-known tiramisu and an even closer cousin to the less familiar Tuscan zuccotto. 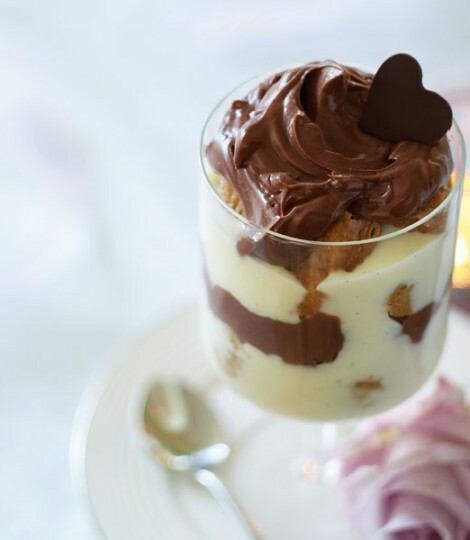 Although the Zuppa Inglese’s origins are debatable, it bears a strong likeness to the English trifle. No matter the roots, this Italian trifle is sure to satisfy that sweet tooth and make an impression among friends and family. Mix the rum and liqueur in a bowl and pour half of the mixture into a second bowl. Sieve the ricotta into one of the bowls and stir until thoroughly mixed, then stir in about one-third of the chocolate. Put the sugar, vanilla, and water into a small saucepan and melt together until a smooth caramel syrup forms (see caramel making tips below). Allow the syrup to cool to a point that’s bearable to touch, then pour into the ricotta mixture gradually, stirring constantly. Dip the ladyfingers into the remaining rum and liqueur mixture, then arrange a layer in the bottom of a bowl. Pour a layer of the ricotta mixture, and then cover with another layer of dipped ladyfingers. Continue until all of the ricotta mixture and the ladyfingers have been used, finishing with a layer of the ricotta. Sprinkle over the remaining grated chocolate and chill for at least one hour before serving. There are various stages of caramel, from the palest yellow to the darkest, burnt-sugar brown. At each stage, the flavor of the caramel intensifies. In all cases, the secret is never to give in to the temptation to stir the melting sugar. Swirl the pan gently, taking great care not to splash onto your skin as it will stick to you and burn terribly. The swirling action should be enough to mix the sugar and water, and thus caramelize it evenly. Never abandon your caramel while it is cooking, but watch it carefully to be sure it doesn’t burn or cook unevenly. Special thanks to losing control. and Audrey T for editing!